So this week I have the privilege of hosting Post Comment Love for the lovely Vicky Welton over at www.vevivos.com while she is away on holiday (hope you're having a fabulous time, Vic!). I'm a little bit nervous about it because I'm slightly in awe of her as a blogger (ssshhhh!) so it feels kind of strange to be having such a well thought of, successful linky of hers over here in my little corner of cyber space! Despite that, I'm glad you've found your way over here and I'm excited to get to know you all and find some new, lovely blogs to read. The last few weeks have been a bit quiet over here because we've had a couple of breaks, holidays and celebrations and it always seems to take me an age to get back into a routine with blogging, life. This week, however, hubby is working a five day week (finally!) which has given me a chance to catch up, settle in and get some things done! Normal service will resume, I promise (whatever normal is, anyway!). We've been loving the sunshine and are sad to see it slip away from us, spending time with family, reading this book, buying more books (The Works have a lot to answer for, I'm telling you! ), and making September plans which may all fall to pieces should I bite the bullet and get a job - you can read about that ongoing struggle here. Anyway, thanks for dropping by, and without further ado, on to the #PoCoLo fun! 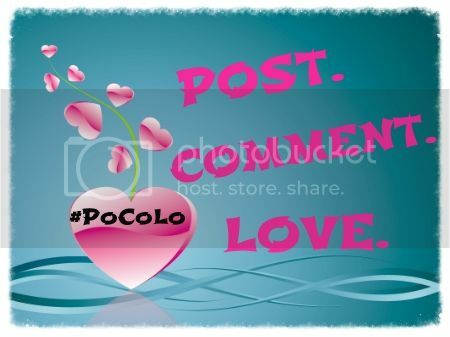 If you are a regular linker then it would be great if you spread the #PoCoLo word. However, if you are new then welcome! Post Comment Love is all about sharing posts which you have written this week which just haven’t got the attention they deserve and, with them all in one place, we can help each other share the comment love. This is one of the easiest links EVER. You don’t have a ‘special theme’ to have to write about, the post can be personal, sponsored, a photo, a review, a competition, your own linky, something you've linked to a linky….WHATEVER you like – as long as it’s one you've already written this week! If you want some publicity and attention, then you are in the right place! If you link up, don't forget to tweet me @EmilyDavies85 as I'll endeavour to give you all a shout out at some point over the weekend! Vicky has a list for the Newbie Showcase running into March 2016. If you would like to be featured then please email her at vickywelton@hotmail.com so she can put you on the rota. Remember, your blog needs to be under a year old to feature from the time of sending your email to her. Now, unfortunately the Newbie Showcase Vicky had organised for this week has been unable to take part which is a shame. So, I hope Vicky and the rest of you awaiting your Newbie Showcase don't mind - it's not my intention that anyone should skip the queue, but I wanted to offer something up to you all in its place rather than leave you hanging. I'd instead like to introduce you to my friend Kate at Yes, She Writes. Her blog is just over a year old (sorry, cheating! ), but it has only taken shape recently as she has relaunched it this month and it is pretty awesome. She blogs about beauty, fitness, books and basically anything that takes her fancy, but she's funny and quirky and all those good things in between. You should definitely check her out, but I particularly think you'll enjoy this post about her love/hate relationship with yoga and this post about her secret super power - complete with crap pen drawings to illustrate (you'll like them). EDIT: Sorry, the linky isn't showing in situ - can't work the html. If you click the link above it will take you to all the other linkers and to link up your own post. Thanks! You're welcome, Izzie! Thanks for coming! Thank you for hosting the #PoCoLo. I'll have to come back and read a few more of your posts this weekend. Thanks for hosting! ...Even when it doesn't all work out quite how we planned!